Like CliffsNotes for People, Facebook profiles provide us with a succinct getting to know you guide to any individual, where a person’s likes, snapshots and status updates have become the cyber version of a first date. Namely, we find out things we used to learn by having a good old-fashioned conversation with a friend request and a click of the mouse. 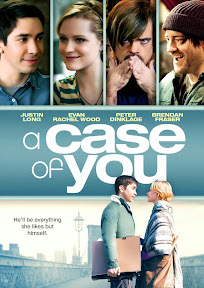 Using this idea as a jumping off point to explore what would happen if a shy guy took the Facebook profile of the object of his crush-worthy affection far too literally to become what he believes is her ideal mate, affable actor Justin Long makes his screenwriting debut, starring in the work he penned alongside his brother Christian and co-star Keir O’Donnell. 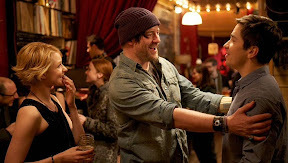 A frothy, sweet romantic dramedy confection with a dry sense of humor that translates a bit awkwardly onscreen, Long’s Case is as in need of mischievous laugh-out-loud fun as it is a stronger sense of just who our lead character actually is before he undertakes his romantic quest to become the real-life version of the blonde, bubbly barista Birdie’s online dreams. 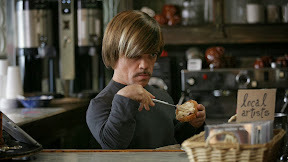 Directed by actress turned Life Happens helmer Kat Coiro, A Case of You’s weaknesses are easily overshadowed by the appealing star-studded supporting cast’s obvious commitment to and infectious energy for the scene-stealing characters they play from Vince Vaughn’s macho publisher and stoned out Spin Doctor guitar instructor Sam Rockwell to Wood’s oddball coworker Peter Dinklage and outgoing ex Brendan Fraser. 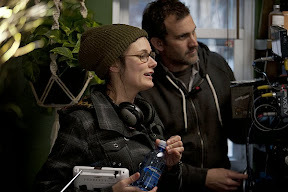 The film centers on Long’s insecure writer Sam, whose carting around massive invisible baggage thanks to the trust and commitment issues that stem from his heartbreaking estranged relationship with the mother who’d walked away from him along with his bookish father in favor of an exciting new man. Deciding he isn’t ready to put himself out there without at least some kind of established (albeit manufactured) connection, Sam uses Birdie’s profile to become someone completely different from himself to attract the effervescent beauty (played by Evan Rachel Wood). From taking dance, cooking and guitar lessons to purchasing her favorite books and music (including, I presume the Joni Mitchell titular song that is never played or mentioned in the film), Sam fails to realize what the audience, his friends and Birdie already understands, which is that the most interesting person he can possibly be is himself. Likewise, anytime he reveals anything genuine about himself in the film, he’s easily one hundred times more fascinating than the polished, rehearsed guy he’s trying to be. Finding himself as attracted to Birdie as he is inspired by the caricature artist who seems to be a (thankfully) more relatable version of the stereotypical rom-com free-spirited hippie waif of the over-exaggerated love child of Goldie Hawn meets Drew Barrymore variety, Sam’s love life soon also serves as fodder for his new manuscript. Branching away from the horrific teen vampire movie novelizations he’d written in the past to create something far more authentic, he chronicles his relationship with Birdie including all of the hopes, fears, secrets and lies he’s too afraid to reveal anywhere but in print. Although Long’s muse-like plotline sets Case up for a formulaic finish, one of the film’s most admirable qualities is in the way it deviates from traditional romantic trappings. Intelligently written and respectful of the audience's intellect – instead of just plugging the characters and subplots into the same A+B=C genre paradigms we’ve seen again and again, A Case of You lets its hero’s motivation be its guide, telling a tale of people versus a formulaic plot. Although we’re enchanted by Wood from her earliest scenes, by not offering enough information about Sam before he begins his plan of romantic action, the film makes it that much harder to root for him or understand his sudden drastic change in attitude when he first picks a fight with Birdie without any real prompting and then inevitably, later sees the error of his ways. A simple fix might have been swapping out the scene order to move an opening sequence that finds him crossing paths with an ex to later on in the film (ideally before the fight) in order to maximize the emotional impact of it so that we fully grasp his level of insecurity. Unfortunately the way it all plays out onscreen keeps us at an arm’s length from Sam from start to finish. Thankfully, Long is so charming that he helps break down some of Sam's and by extension the film's walls. Case finds him playing slightly against type so that he delves much deeper to embody a far more internalized version of the same "nerdy" persona that first introduced him to American television viewers (including yours truly) via NBC's Ed over a decade ago. While his charisma and the palpable chemistry between the two leads helps us get over our some of our hurdles with the main character, the ingenious way that Case introduces and then abandons rom-com red herrings from a likable ex-boyfriend and his tell-all manuscript to Sam’s juvenile conceit that he’s figured out some new dating angle is very impressive for a first time screenplay. While the humor is too understated to set the film apart from superior rom-coms, making Coiro’s work ultimately as forgettable as its title that sadly never pays off on the promise or allusion to Joni Mitchell, A Case of You is still a warmhearted effort that’s sure to inspire discussion about the ups and downs of love in the time of Facebook. As succinct as a Facebook profile (by clocking in at a mere 91 minutes), this IFC Films release hits shelves just in time for Valentine’s Day. And even though it’s light on special features, by managing to work in an opportunity for Across the Universe star Evan Rachel Wood to delight viewers with a song, this enjoyable film gives us the greatest bonus in the feature film itself by bringing us both music to our ears and a potential status update to “like” on our Facebook page.